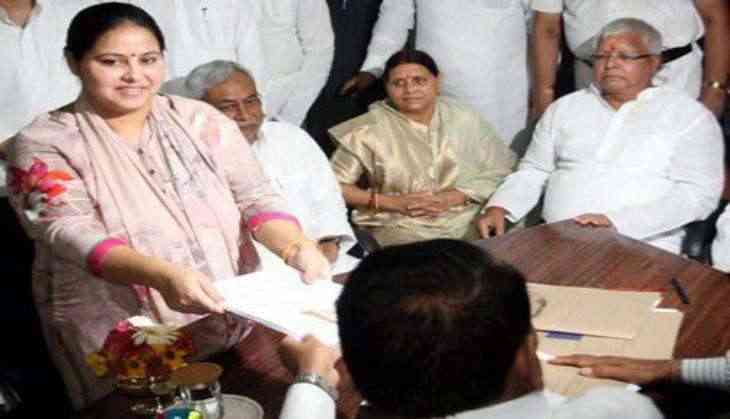 The police custody of Rashtriya Janata Dal (RJD) supremo Lalu Yadav's daughter's chartered accountant Rajesh Agarwal has been extended by seven days in connection with a Rs. 8000 crore money laundering case. Earlier, Lalu's daughter Misa Bharti and her husband were summoned by the Income Tax Department in connection with a 'benami' assets case. The summons were issued days after the arrest of Agrawal in connection with an Enforcement Directorate probe into a Rs 8,000 crore money laundering racket involving two Delhi-based businessmen and a few political entities. Agrawal was arrested under provisions of the Prevention of Money Laundering Act (PMLA) for allegedly being instrumental in providing accommodation entries (illegal funds) to launder the money of businessmen brothers-- Virendra Jain and Surendra Jain. The Income Tax Department has, in it summons, reportedly said that it wishes to question Misa and her husband on transactions conducted by the M/s Mishail Packers and Printers Private Limited. Misa is also under the scanner for dubious land ownership deals. The income tax department had conducted raids and surveys at about 22 locations in Delhi and adjoining areas last week in connection with alleged benami deals of Rs 1,000 crores by Lalu's family.